This magnetic floor sweeper keeps your garage and metal shop clear of screws, nails, nuts and metal shavings on the floor! The magnets in this floor sweeper are powerful enough to pull 9 lbs. of metal from hard surfaces and low carpet. Features include a one-pull release to quickly clear debris from the sweeper. 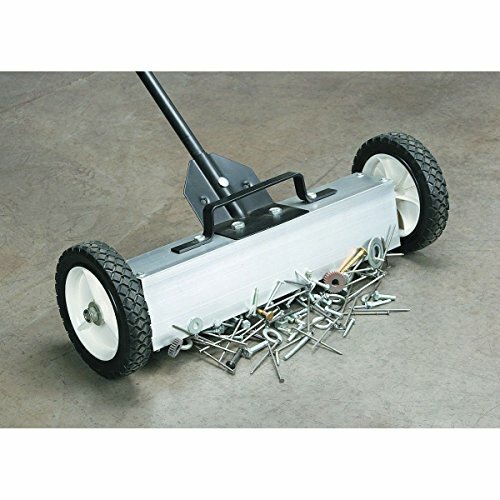 An ideal magnetic floor sweeper to increase safety by clearing sharp metal, retrieve nuts or bolts and prevent flat tires over loose nails! Handle extends from 37" to 51"
Ground clearance (in.) 2-1/8 in. Maximum Working load (lbs.) 9 lbs. Handle Length (in.) 37 in. To 4-1/4 ft.
Sweeper length (in.) 22 in. M-B Tough Brush - 21" x 6 3/8" Convoluted Combo (Poly & Wire) Wafers. Replacement brushes for various sweeping brooms and machines.